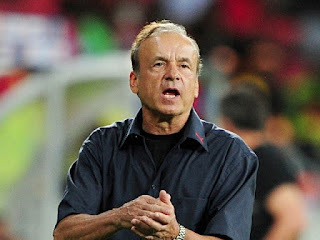 The Nigerian Football Federation have paid the outstanding salaries owed the technical adviser of the Super Eagles Gernot Rohr and 27 other coaches, reports Completesportsnigeria.com. Rohr was reportedly owed five month salaries while the other coaches were owed outstanding salaries. The NFF recently signed a N2.5 billion sponsorship deal with oil company Aiteo Group who will assist in paying the football body's salaries. According to a report on official website of the Nigerian Football Federation, no fewer than 27 coaches were paid their outstanding salaries owed them by the body. "The salaries of the Super Eagles’ Technical Adviser, Mr. Gernot Rohr, have also been settled up-to-date from the forex component of the transaction with Aiteo," the NFF announced on Tuesday. The payments were made direct to the accounts of the beneficiaries through NFF’s Financial Consultants (Financial Derivatives Company), appointed to manage the funds from the sponsors upon verification of the processes by NFF external auditors, PWC and payment instructions from the NFF secretariat.